All Slides feature replaceable slide blankets, and replaceable high-density foam climbing steps. Additional tie-down straps, safety netting, and curved stop walls are just a few of the exclusive features that help make our inflatable slides some of the safest in the industry! This commercial slide is great for all year because it is fully shaded and has wet and dry slide! 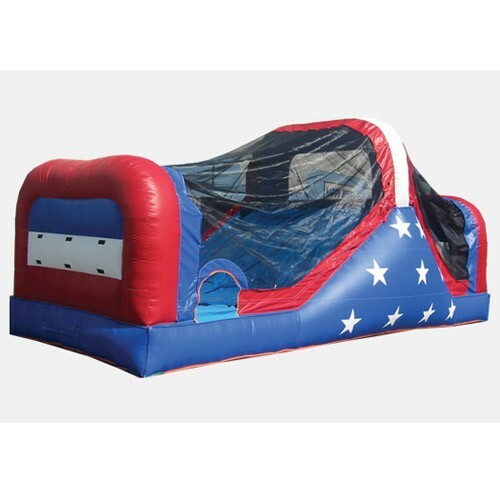 The 12' Patriotic Themed Happy Slide is a great unit for your rental business, Church, or institution. Made of heavy duty commercial grade 18oz reinforced PVC Tarpaulin material. Our KidWise Units are backed with a One Year Warranty against material defects and workmanship. All Slides feature replaceable slide blankets, and replaceable high-density foam climbing steps. Additional tie-down straps, safety netting, and curved stop walls are just a few of the exclusive features that help make our inflatable slides some of the safest in the industry! This commercial slide is great for all year because it is fully shaded and has wet and dry slide!